Gene Burnett’s motto is simple, "use less force." Watching him play an acoustic guitar, trading songs with friend Seth Richardson, it was clear he applies his mantra to his music. As Richardson strummed and sang a melancholy number, Burnett rested his chin on his guitar, offering sparse notes from time to time. Burnett’s affinity for Paul Simon and James Taylor shows in his voice—a resonant baritone, pleasant and natural. Richardson’s voice is grittier, trembling and growling at times, but not without its delicate subtleties. Without any sort of amplification or stage, Tuesday nights at Liquid Assets, 96 N. Main St., Ashland, are as intimate and raw as local music gets. You might need to lean in to hear the delicate arpeggios and melodies. You might also need to step around Richardson or Burnett as they often rise from their barstools to stomp out a beat on the wood floor. Richardson is a recent transplant from Cape Cod, Mass., and also plays in the Ashland band Finding Virginia. Burnett is a Tai Chi teacher, musician and poet living in Ashland. He describes himself as a "freestyle Taoist," and says that his songs "reflect and report on my search for an unforced life." Burnett has been writing, performing and recording at least 11 albums worth of material since he was a high school senior in 1975. Burnett sells CDs through his Web site, www.geneburnett.com. He also offers his catalog for download, accepting donations for his music but not stating a price. It’s a move similar to Radiohead’s decision to offer downloads of their latest album for whatever price fans are willing to pay, even if that price is nothing. "No one’s tipped me for the downloads yet except a few friends, but music is free now anyway," said Burnett Tuesday night. "Once it’s on the Internet, everyone can steal it. Might as well give it away." 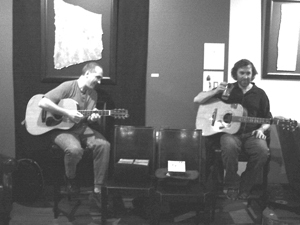 Gene Burnett and Seth Richardson perform every Tuesday at Liquid Assets. The music starts at 7 p.m. There’s no cover charge though Burnett and Richardson do set out a hat.